Silver jewellery is one of those classic fashion accessories that can add sophistication to your outfit. The best way to achieve an ultra classy look is a little black dress teamed with a simple set of sterling silver earrings and a silver pendant. Less is more with silver jewellery, so opt for something subtle that will catch the light – and the eyes of everyone in the room. For an extra touch of elegance, try a silver pendant embedded with a single radiant pearl. If you love Joss Stone and Sienna Miller’s boho styles, you can adapt your silver jewellery to suit. A purple amethyst ring is a great way to add hippy chic to your outfit, as is a turquoise strand bracelet. Crystal jewellery is a big favourite with celebs, so check out the range of different stones that can be set into silver jewellery and have fun playing with the styles and colours. The bolder and brighter the better. If you love all things pink and girly then you can still find silver jewellery to suit your style. Why not try the Wish Collection of necklaces and bracelets, made of pastel pearls and coloured crystal teamed with silver clasps, beads and pendants? You just won’t be able to resist the pale blue freshwater pearl necklace, or the lilac freshwater pearl bracelet decorated with a silver dove. It’s time to get girly! If you have a big personality and love flamboyant fashion, then you need silver jewellery to match your style. Go for big, bold designs, and opt for dramatic stones like black onyx or blood-red garnet. Chokers look ultra-glamorous for nights out, and look amazing teamed with a slinky dress or trouser suit. Plain silver jewellery may look too subtle and understated for you, so seek out gemstone jewellery, big beads and dangly earrings. If you want to make an impact in the office, you need to get your look just right. For a professional image keep your outfit simple, with well-tailored suits or a pencil skirt and crisp shirt. 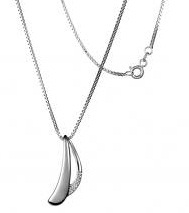 Silver jewellery can add that extra touch, but don’t overdo it with anything too showy. A delicate pendant and stud earrings are perfect, and will show you mean business. Gems TV offers a great range of jewellery at excellent prices.